"I can't wait to meet my brother!" Universal has debuted a second trailer for Illumination Entertainment's next sequel to Despicable Me, titled just Despicable Me 3. 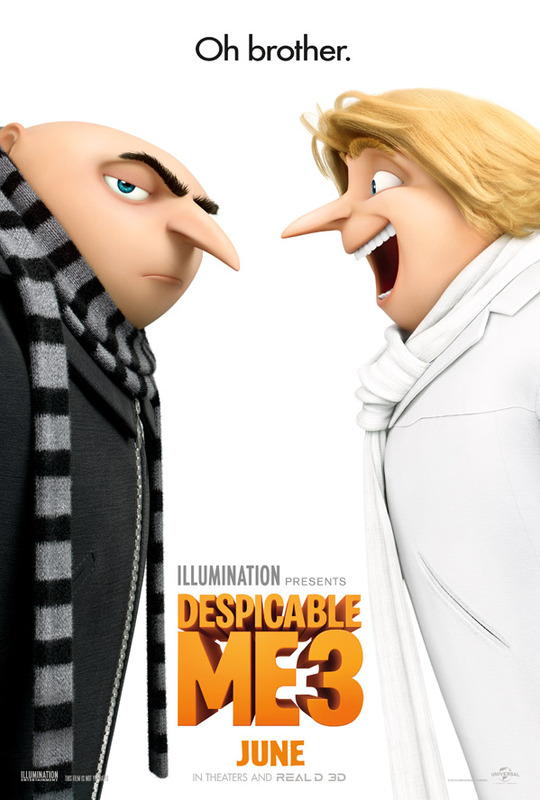 The story brings back the lovable villain Gru (and his minions) for another misadventure, this time involving his long lost twin brother Dru (who is also voiced by Steve Carell). Dru wasn't revealed in the first trailer, but he finally is introduced in this one. The full voice cast includes Kristen Wiig returning as Lucy Wilde, along with Miranda Cosgrove, Russell Brand, Michael Beattie, Dana Gaier, plus also "South Park's" Trey Parker as the stuck-in-the-80s supervillain Balthazar Bratt. This doesn't look any better than it did in the first trailer, but have fun anyway. You can still watch the first official trailer for Despicable Me 3 here, to see even more from this. The team who brought you Despicable Me and the biggest animated hits of 2013 and 2015, Despicable Me 2 and Minions, returns to continue the adventures of Gru, Lucy, their adorable daughters—Margo, Edith and Agnes—and the Minions. Gru's long lost twin emerges and he has to deal with a sibling rivalry. Despicable Me 3 is directed by veteran Illumination filmmakers Kyle Balda (of Minions, The Lorax) and Pierre Coffin (of Minions, Despicable Me), and also co-directed by character designer Eric Guillon. The screenplay is written by Ken Daurio and Cinco Paul. Universal will release Illumination's Despicable Me 3 in theaters everywhere starting June 30th this summer. Who's excited to see even more mayhem from Gru?